Do Case Discounts Actually Stifle Wine Purchases? Lot18 runs free shipping offers quite frequently, and they're shipping more wines to MA than they used to. Check it out! This question has been on my mind for some time so I thought I'd get it out there for discussion both from consumers and retailers alike. If you're like me and many of my friends, your cellar is full, you've got more wine than you need and yet you're always in the market for certain specific wines. If a retailer has a wine you're looking for, and that retailer has a pricing model where for example a mixed case is 20% off - what do you do? Do you put together a 12 bottle case of other wines you know you'll eventually drink? Do you get together with friends to split a mixed case? Or do you consider the whole production a hassle and delay the purchase indefinitely? Are case discounts actually having the opposite effect they're intended to have? There are basically three pricing models in stores in this respect: Low, medium, and high case discounts. On the low side we have operations where the first bottle is offered at the maximum discount. There are no case discounts. In the middle is a more moderate 10% - 15% discount for a mixed 12 bottle purchase. At the other end of the spectrum are placed where 25% or even 30% discounts are offered for mixed case purchases of 36 bottles. Typical margin for a retail wine shop is 33% so when a retailer offers a 30% discount it's usually what's required to get the prices down out of the stratosphere. For both the middle and high discount case purchase models, sale items are typically excluded because offering a wine for 30% off would create a situation where the retailer would sell a product for less than they paid for it. Not that a retailer would like to do this, but it's illegal in Massachusetts. Sale items usually count towards reaching the required quantity of bottles, but they're not discounted below their sale price. Which model works best for consumers? And which is most effective for retailers? My reason for writing this is I often find myself not buying from retailers whose model requires hefty case purchases for favorable pricing. If there's one thing a deal hound hates it's paying more for something than he has to. Even if it's just a few dollars here and there, it's a percentage game because over time the dollars add up. Some retailers will give you a case discount if you're a regular even if you buy just 2 or 3 bottles. While this sounds good in theory in reality it's annoying to both consumers and retailers. It's annoying to consumers the first time they visit a shop and the employee who typically gives them the discount doesn't ring them up. And it's annoying to retailers because once a customer gets a discount they expect it forever. I like a model where I only have to buy what I want, and everything I buy is at the best possible price. I like receiving emails offering specific wines at very aggressive prices that I can pick and choose from, buy what I want, and over time build towards a case purchase. Then, I'll either pick it up at the store or arrange for shipment a couple times a year. This is different than what I look for when buying, for example, a bicycle. Or tires. I don't buy bicycles or tires often enough to sweat it. I just visit a local shop or two, consider convenience and service, and go with my gut instinct. But when you're buying wine again and again it pays to think about this stuff. Consumers: What do you think? Looking back over the past couple years which models have earned more of your business? Retailers: What are your thoughts on this? How did you decide to go with the case discount model you're using? And what trends have you seen as you've run specials offering deeper discounts with lower quantity purchases? On Tuesday, April 24th 2012 Blue Ginger in Wellesley, MA is hosting a paired wine dinner featuring Knights Bridge Winery. The event costs $145 inclusive of tax and gratuity. Click here for details and more information. 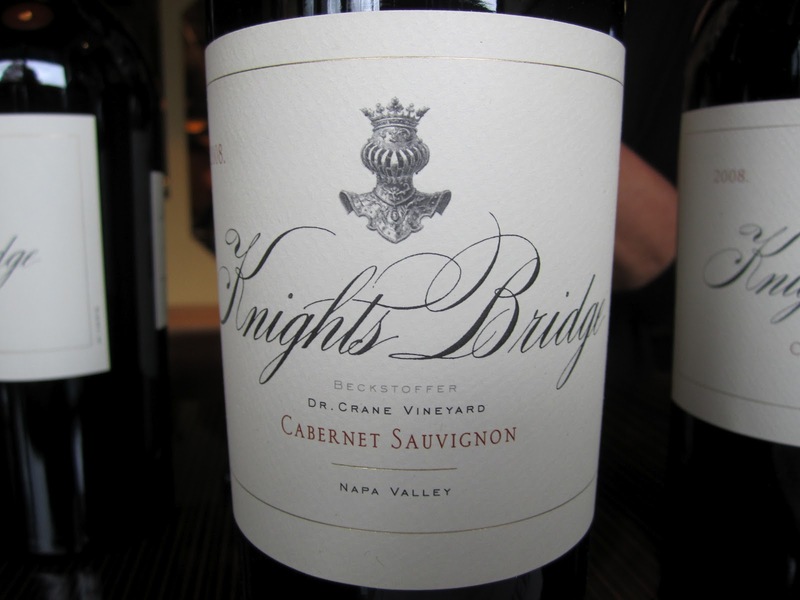 I sat down with Knights Bridge Managing Director Timothy Carl to preview the wines slated to be poured at the dinner and learn more about the winery. I hadn't heard of Knights Bridge until recently. For some reason, when I first heard the name Knights Bridge I immediately thought of the well-regarded-as-a-value-play Beringer Knights Valley line-up. 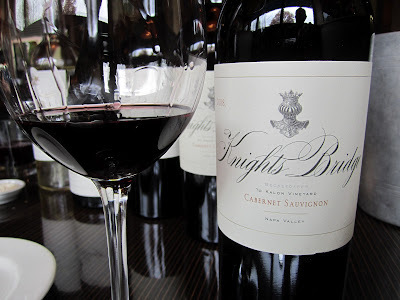 The Beringer wines are good, but a better comparison for Knights Bridge would be Peter Michael whose vineyards are a stone's throw from Knights Bridge's 120 acre estate north of Calistoga in the slopes of the Mayacamas mountain range. Tim is one of those guys who lives in many circles. PhD in genetics. Harvard Fellow. Consulting experience at McKinsey and Putnam Associates. Quartermaster in the US Navy. Chef. UC Davis-education in winemaking. The guy loves to learn. 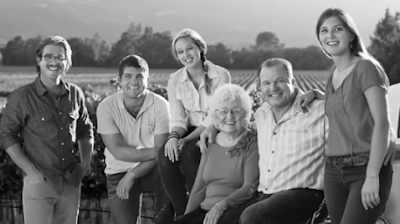 In 2005 he left Boston to return home to northern California and he's now bringing that experience, backed by 6 generations of winemaking, to the relatively new endeavor that is Knights Bridge. Their first officially released vintage was 2006 and they currently produce 1,200 cases. When I asked him how he plans to get the attention of today's fickle wine consumers he said, "By making the absolute best wine possible." For him, everything comes back to that: Producing the best balanced wines they can. We started off with a 2009 Pont de Chevalier Sauvignon Blanc. French for Knights Bridge, it's their second label. It was aged in stainless steel and neutral oak barrels (previously used, in this case for Chardonnay). I thought it was golden and sunny yet balanced nicely by racy minerality and acidity. Green apples and lemon zest. Tasty. 120 cases produced, $40. 89/100 WWP: Very Good. 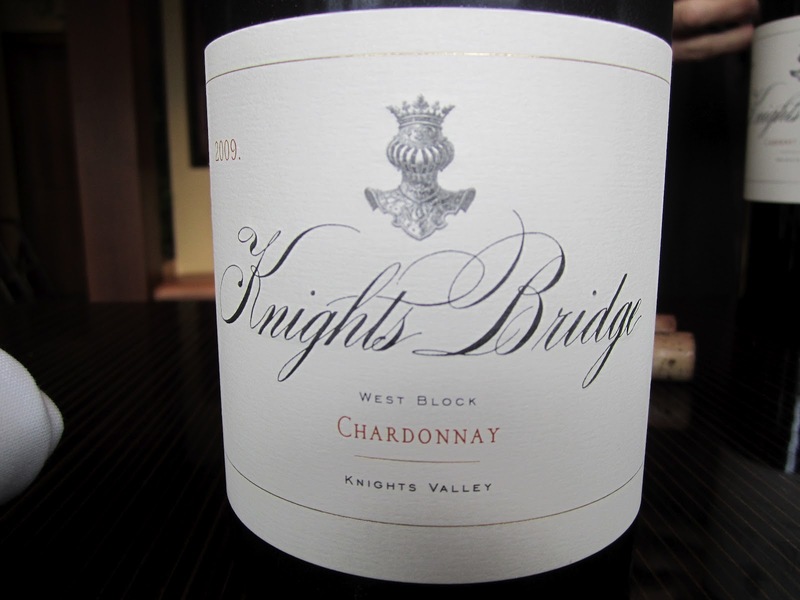 Next up was the 2009 Knights Bridge West Block Chardonnay. This wine was chosen, along with wines from Screaming Eagle, Harlan, Colgin, Staglin, Peter Michael and others, to be poured at a reception at last year's G-8 summit at the Louvre. After tasting the wine I can see why it was included in this illustrious company. The wine weighs in at 15.5% alcohol but you'd never guess it. Light golden in the glass, it's tremendously round and creamy yet beautifully clean and elegant. Complex aromas and flavors that seemed to change each time I tasted it. Most notable were roasted pear with coconut cream pie in the background. 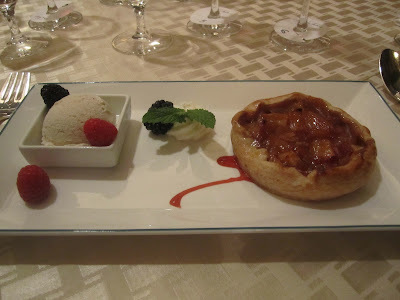 But approached from a different angle when tasted with food, zesty citrus aspects came forward. Quite a wine. 200 cases produced, $65. 93/100 WWP: Outstanding. Timothy explained that the Knight's Valley AVA is unique in it's ability to produce both great Chardonnay and great Cabernet Sauvignon. This, he said, was due to diurnal temperature swings greater than 50F in the summer along with cooler micro climates where Chardonnay can excel. 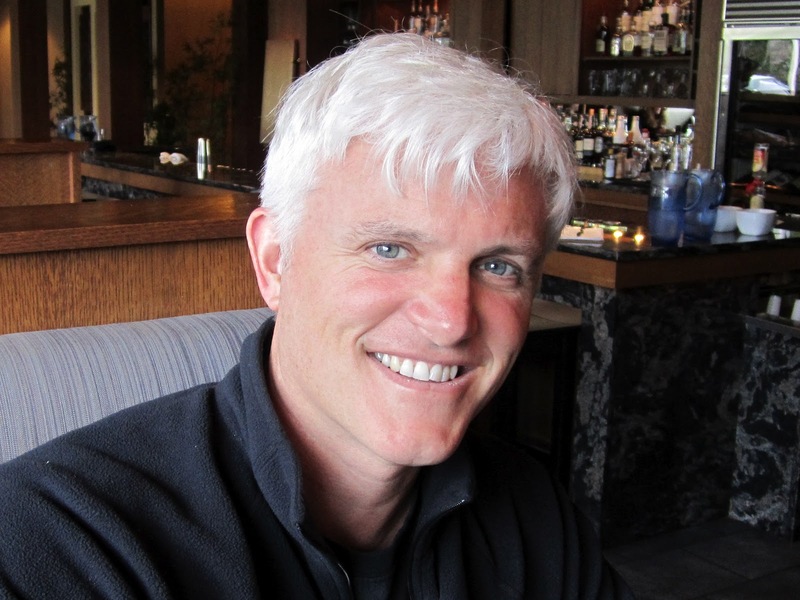 The winemaker for both the Chardonnay and the Cabernet Sauvignon is Jeff Ames. Jeff has served as an assistant winemaker to the highly regarded Thomas Rivers Brown and has helped produce wines for Schrader, Maybach, and and Outpost as well as his own label Rudius. The first Cabernet we tasted was a 2008 Knights Bridge Cabernet Sauvignon produced from mountain fruit from their estate vineyards in Sonoma (the Bridge in Knights Bridge is named for the "bridge" of sorts their property forms between Sonoma and Napa). The wine was aged for 28 months in 100% new French Oak and weighs in at a moderate 14.5% alcohol. The wine snuck up on me a bit. At first it presented itself as a "nice", pleasant, smooth Cab. But it built power on the mid-palate as it rested in my mouth and finished with a brawny, delicious chocolate-laced finish. 300 cases produced, $115. 92/100 WWP: Outstanding. Next up was the 2008 Knights Bridge Beckstoffer Dr. Crane Cabernet Sauvignon. It was aged for 21 months in 100% new French Oak and is 14.9% alcohol. The Dr. Crane vineyard is just west of Tre Vigne restaurant if you're familiar with the area and is known for its rocky soils which tend to produce wine with small berries and scorched earth characteristics. It was quite a bit more tannic than the Knights Bridge at this stage, but also more complex and powerful. 135 cases produced, $135. 92/100 WWP: Outstanding. The final wine we tasted was the 2008 Knights Bridge Beckstoffer To Kalon Cabernet Sauvignon (pronoucned "tow-kuh-lawn" and Greek for "highest beauty"). To Kalon is arguably the most sought after vineyard in America - especially amongst those who sell their grapes to other producers. The only domestic wines Wine Spectator has ever rated 100 points came from this vineyard in the form of Schrader's 2007 MM-VII and CCS bottlings. Also aged for 21 months in 100% new French Oak, the grape clusters were destemmed and cold soaked for 24 hours then fermented on skins in tank. The wine is massive with explosive notes of blackberries, mocha, cinnamon, and chocolate covered espresso beans. Chalky, mouth-filling tannins support a long flavorful finish. Quite spectacular. 110 cases produced, $135. 94/100 WWP: Outstanding. An excellent blog post popped up in my Flipboard Google Reader feed this morning. It has nothing to do with wine but it was useful, interesting and made me think a lot about the things I write about here on this blog. The post is about procuring new wheels and tires for a BMW by Chris Parente. The steps Chris went though researching, ordering, tracking, negotiating, receiving and assembling the order were very familiar to me. They're eerily similar to what we go through as wine deal hounds. With the exception of installation, I do all of these things when I'm buying wine. Sure, there's the occasional impulse buy at a local wine shop or grocery store, but the bulk of my buying these days is online, in response to email offers, or winery direct. Like Chris with his interest in specific wheels and tires, once you've gone Wine Berserkers you want very specific wines. What I liked about the post is that he gave specific examples of resources he used and how he went about the process. I can see my way to leveraging his techniques and having a more enjoyable experience by getting better products and service at the best possible prices. Coincidentally, if I had once sentence to describe the mission of this blog that would be it. What got me thinking the most about his post, though, is the question of whether it's worth it. Or rather, whether I'm interested in getting into another high involvement hobby. You can tell how much time and research went into tires and wheels for one of his cars - imagine extending that across the entire enthusiast experience. You've got to want it and it's got to be a priority to do it well. I spend hours each week thinking about wine. Reading articles, blogs, consulting and contributing to CellarTracker, looking for deals on wine-searcher.com. Buying it, drinking it, visiting wineries, attending events - writing about it. When I need new tires or wheels I just got down to DirectTire and they take care of it. Similarly when I needed a new bike for our 7 year old recently. We just went to a couple shops nearby and bought what seemed to be a good fit for our needs. And maybe that's fine for the occasional purchase. Spend the time saved burning up the web for the best deal on healthier pursuits. Life in balance, right? But I wouldn't mind being more savvy in more domains. And that's why I enjoy acquiring and sharing knowledge via blogs and social networks. Mainstream publications just don't cover this stuff in a way that's as focused on the consumer experience. You can't go too deep into too many hobbies. But you can learn a little from someone who's deep in a topic and can share useful information. Chris does that and reading his post reminded me to try to do a little more of that here on this blog. PS This post was written on an iPad with Blogsy. Legal Harborside in Boston is offering a paired dinner featuring Littorai Wines. Owner Ted Lemon (featured in the video above) is scheduled to be on hand to present his wines. WHAT: On May 9th, Legal Harborside will team up with Ted Lemon, owner of Littorai Wines, for an exclusive four-course wine dinner. A vineyard known for producing world class chardonnay and pinot noir, Littorai Wines was founded in 1993 on the north coast of California between Sebastopol and Freestone in western Sonoma County. Video Credit: A visit to Littorai from WinoBrothers on Vimeo. The Wagner Family of Wine includes Caymus Cabernet, Belle Glos and Meiomi Pinot Noir, Mer Soleil Chardonnay, and Conundrum blends. Joseph Wagner (second from the left in the photo above) hosted an evening at the Boston Wine Festival featuring their wines including a retrospective sit-down tasting of Caymus Special Selection Cabernets followed by a paired wine dinner. Some of their more expensive wines were every bit as good as I hoped they'd be. And a couple of their more affordable wines showed absolutely spectacularly in an elegant setting. Between the seminar and the dinner was a reception where Conundrum White was poured. According to Wagner, Conundrum was created to enjoy with Asian fusion cuisine. It's one of those wines that, I think, makes numerical ratings seem especially silly. Because either you like a slightly sweet fruity white wine or you don't. It's not a question of quality. It's a question of style. It carries a $24 release price and is readily available available at retail south of $20 thanks to 92,000 cases of the wine being made at last check (2007 vintage). They've recently introduced a Conundrum Red as well. Wagner kicked off the evening by mentioning that Chef Daniel Bruce never makes the same dish twice for these wine dinners. The Boston Wine Festival runs from January to March and features some of the top wineries and the world. The Boston Harbor Hotel has these things down to a science. I thought the service was excellent. The first course was a Pan Roasted Cod Loin with a Georgia Sweet Pea and Chardonnay Sauce. Next up was were the Pinot Noirs. 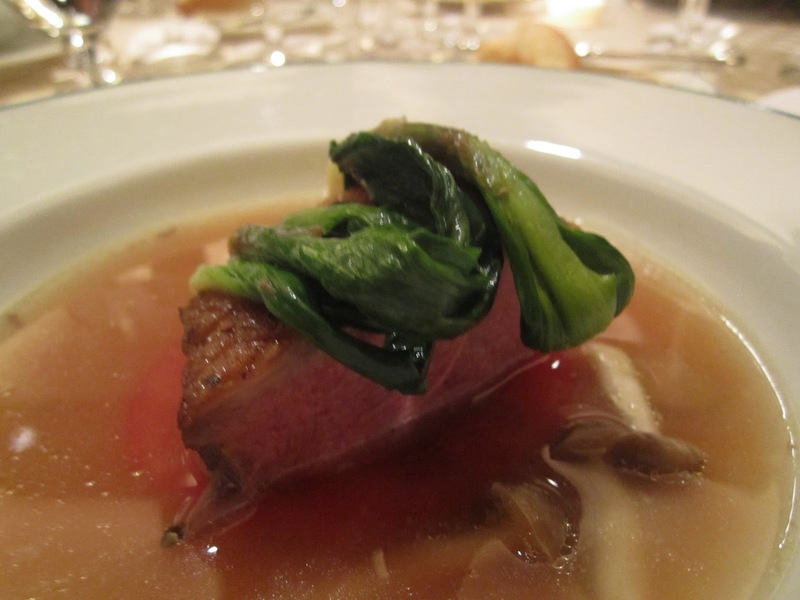 Chef Bruce prepared a Flash Smoked Slow Roasted Long Island Duck Breast in a Tomato, Wild Mushroom, and Wild Leek Broth. It was a brilliant pairing. I was sitting next to Joe at the dinner so I got a chance to chat with him quite a bit. He's only 29 years old, but coming from a line of five generations of winemakers has clearly provided him with a wealth of knowledge he's putting to good work. He's got five (5!) kids of his own and, charmingly, stopped to take a picture to send home to his kids of a Lego man they'd sent with him with the audience in the background. Belle Glos is named after Joe's 96 year old grandmother Lorna Belle Glos Wagner. Joe said she drinks "whatever she wants" but mostly Conundrum these days. Joe's brother Charlie focuses on white wines for the family. They have two sisters who are increasingly getting into the business. Even though production levels have increased since their first publicly released vintage in 1972, it's still very much a family affair. I asked him what other California Pinot Noir producers he'd recommend for folks who like the Belle Glos style. Three he mentioned included Pisoni, MacPhail, and Peter Michael Le Moulin Rouge. Check 'em out! The main course was a Herb Rolled Char Grilled Prime Tenderloin with Bacon Tossed Marbled Potatoes, Baby Zuccini, and Spring Onions. Sorry, no picture. I must have enjoyed it before remembering to snap a photo! 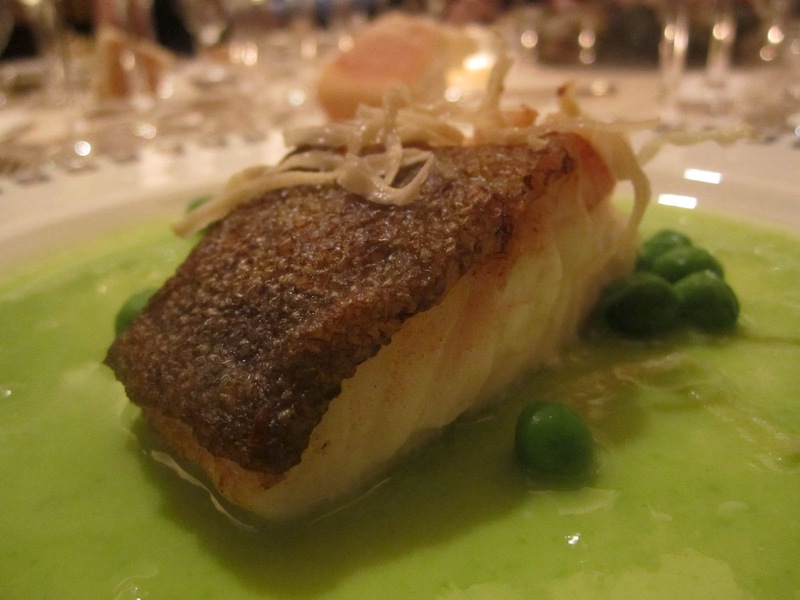 It was served with two Caymus Special Selection Cabernet Sauvignons: 2005 and 2009. It was interesting to taste these wines from the earlier seminar again, from different bottles, and along with food. The 2009 settled down a bit when paired with food (I thought it was extremely fruit-forward at this point) and the 2005 was vibrant with the tenderloin. Gorgeous stuff. A Warm Nectarine Crostata with Honey Strawberry Coulis and Honey Ice Cream was paired with a 2004 Mer Soleil Late Harvest Viognier. It was a delicious end to the evening. If there's one thing the wines in the Wagner line-up represent, it's the intersection of delicious, approachable, high quality wines. Their entry level wines provide an affordable window into their style of winemaking and their more expensive bottlings are often rewarding purchases. The Meiomi Pinot Noir is hard to beat south of $20. And the Mer Soleil SILVER Unoaked Chardonnay is one I'll seek out again. Combined with the always-delicious Belle Glos Las Alturas Pinot Noir, these are some of my favorites value plays in the market. The Boston Harbor Hotel does a tremendous job with these wine dinners. Check out the Boston Wine Festival next year when it comes around again. Disclosure: Attendance on a complimentary blogger pass. Coming up next on the WWP: Trip reports on Littorai and Kosta Browne. I'd love it if you SUBSCRIBED to be informed of new posts.